Paris in the spring... brings back memories, doesn't it? No, not that beautiful romance you had, drinking endless wine and dancing by the Seine - Broken Sword, you dummy. It's been a long time coming, but after various re-releases and HD remasters, Revolution Studios has released a brand-new Broken Sword game. For those who are new to the series (that will be a lot of players - the last new game was released in 2006): Broken Sword is a seminal point and click adventure series that began life in the 1990s. It was acclaimed for its cinematic style and high quality writing. It was also telling stories about ancient mysteries tied to the church and medieval Europe a long time before Dan Brown was at it. The Serpent's Curse sees many memorable Broken Sword characters such as Gendarme Moue return, but of course it's series protagonists George Stobbart and Nico Collard who steal the show. They're on the trail of a missing painting, and the quest to find it will see them tangled up in a conspiracy even older than the written word. As ever, there are plenty of puzzles to put your grey matter to the test, but if it all gets a bit much there's a hint system in place to help you through. This Nintendo Switch release of the game includes a brand new control scheme to make use of the joy-con and touch screen, as well as exclusive behind the scenes videos. 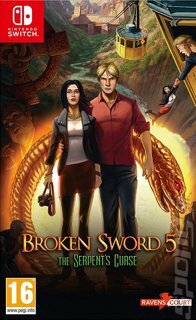 The Serpent's Curse is a welcome return to Broken Sword for many, and a great jumping on point for many more.